Indonesia is one of the region’s best success stories. Despite having faced economic turmoil in the 1997 Asian Financial Crisis under the authoritarian Suharto regime, Indonesia is today one of the fastest growing economies in the world. The main focus of its economy has been the export of goods such as textiles, automobiles, electrical appliances, and oil and gas. As of late, however, Indonesia’s growing digital economy has also contributed significantly to the nation’s growth and the republic is digitizing rapidly. It is forecasted to add 50 million new internet users between 2015 and 2020. Social media usage in the country is also among the highest in the world. According to a recent McKinsey report, Indonesia’s e-commerce sector is comprised of US$5 billion of formal e-tailing and more than US$3 billion of informal commerce. E-tailing businesses are the ones that many of us are familiar with and includes the likes of eBay and Amazon. In Indonesia, the notable e-tailing websites are JD, Lazada, Shopee and Tokopedia. Conversely, informal commerce involves the buying and selling of goods through unofficial means such as the use of social media and messaging platforms like WhatsApp and Facebook. Unlike in many other countries – especially in the West – informal commerce or social commerce is thriving in Indonesia. In fact, according to the latest available data, social commerce accounts for 40 percent of all e-commerce sales in the country. This indicates that many big e-commerce players such as JD and Lazada have not completely penetrated the e-commerce market in the country yet. Among the main reasons e-commerce has seen such a rapid rise in Indonesia is the rapid increase of smartphones being used there. As opposed to online users in Europe or the United States (US), most Indonesians have skipped the digital evolution from personal computers to laptops and tablets, and gone straight to smartphones. Smartphones are also much more affordable than desktop computers and laptops which makes them very accessible to a vast majority of Indonesians. With more than 40 percent of its population on smartphones, about 70 percent of the country’s internet traffic comes from these devices. The McKinsey report highlighted that almost 75 percent of Indonesia’s online shoppers use mobile devices – a much higher rate than neighbouring Malaysia (62 percent) and the farther US (39 percent). On the other hand, the growth of informal commerce can be attributed to the digital-savvy youth of Indonesia. Statistics indicate that Indonesian youths (and to a certain extent their elders) are avid users of social media. The country has the fourth largest number of Facebook users in the world with 122 million people and has one of the largest populations of Instagram users in the region. Indonesia is also the fifth-largest country in terms of Twitter users. With so many social media users, it is no surprise how big informal commerce is in the country. For social commerce to thrive, it requires users that are familiar with the ins and outs of social media. Indonesia’s flourishing e-commerce sector, however, cannot just be attributed to its growing base of consumers. Credit must also be given to the growing number of online sellers too. The number of online sellers in Indonesia has doubled every year for the past three years and reached a total of 4.5 million active sellers in 2017. About 99 percent of these are microenterprises and half of them are online-only businesses with no physical store presence. Online commerce has made it extremely easy for many to start their own business and entrepreneurship has seen a sharp rise in the country. Not only does it encourage a vibrant marketplace but also gives its citizens a way out of their socioeconomic woes. Meanwhile, e-commerce in Indonesia will only get bigger. 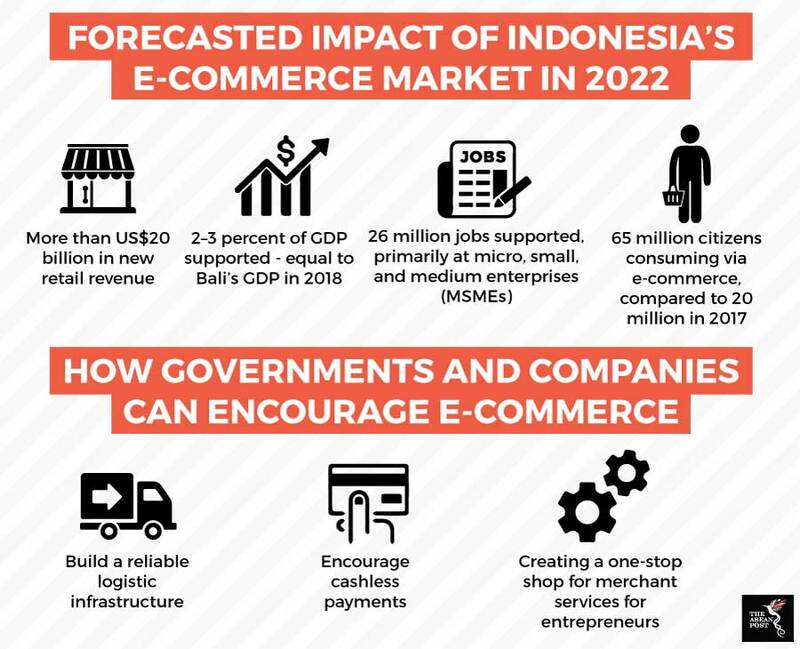 The Indonesian e-commerce market is projected to grow eightfold from 2017 to 2022 with e-tail spending growing from US$5 billion to US$425 billion. Social commerce spending is expected to grow from US$3 billion to between US$15 billion to US$25 billion. As more digitalisation is expected to take place, the digital economy could well be one of the main pillars of Indonesia’s economy in the future. Can local e-commerce players compete in Southeast Asia?